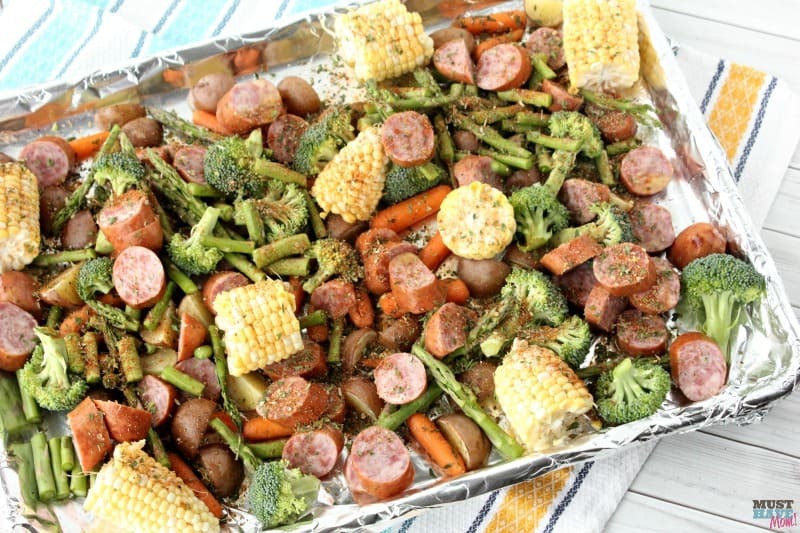 Sheet Pan Dinners Easy Sausage & Veggie Recipe! Have you heard of sheet pan dinners? They are essentially a one pan meal that is made on a single sheet pan, which is lined with foil, meaning easy clean up and a tasty dish! 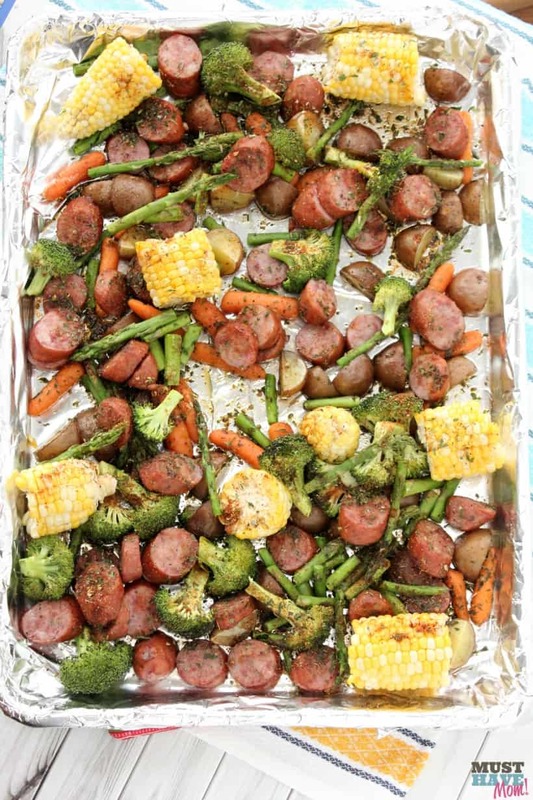 Sheet pan dinners are one of my favorite quick and easy dinner ideas. 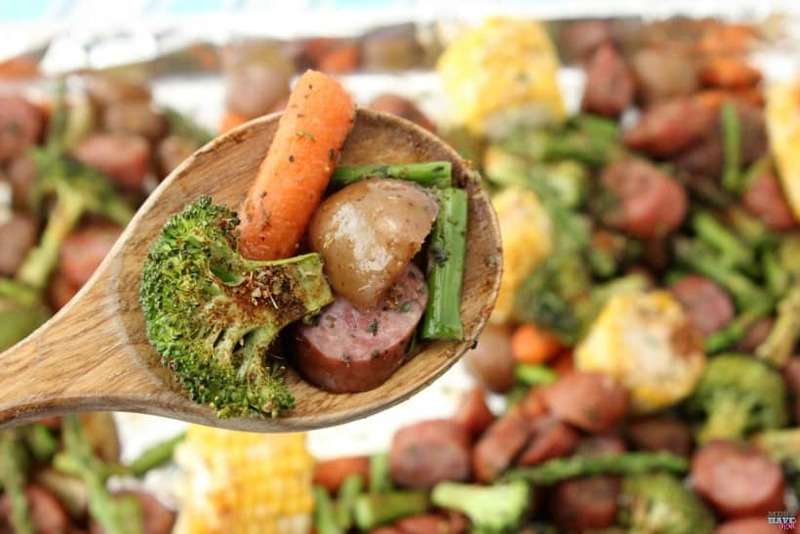 This easy sausage and vegetable recipe is sure to please your entire family! What Are Sheet Pan Dinners? 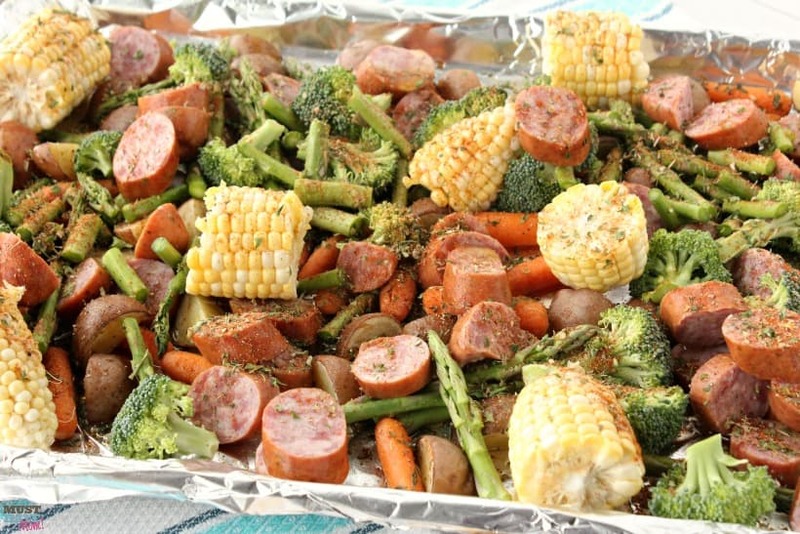 A sheet pan dinner is made on a sheet pan as the name implies and generally, the sheet pan is covered in foil to make clean up easy. That means you have only one dish to wash (rinse and dry) and toss the foil in the trash. It couldn’t be easier! 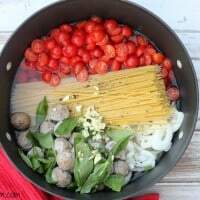 One pan and minimal clean up makes for a perfect easy dinner recipe for a family. You can make the meal as big or small as you want which means this recipe is great for two people or a whole family. You can also use sheet pan dinners as a great way to meal prep for the week. Make a sheet pan supper on Sunday night and then package it up in individual servings for the week. Serve it over rice, quinoa or zucchini noodles for a healthy lunch idea at work! Weeknights get SO busy. By the time homework is completed, chores are done and bath time accomplished, that leaves little time for dinner. I want to make sure my family always has a healthy, tasty meal on the table by dinnertime and sheet pan dinners mean minimal prep and virtually no cleanup which makes them my go-to on busy nights. Check out my video that shows you exactly how to make easy sheet pan dinners. You can mix this up for whatever ingredients you have on hand. I love making this at the end of the week when I have random vegetables in the fridge that I need to use up! Don’t be afraid to play around with the ingredients in this recipe. It’s very flexible. You need very little supplies for a sheet pan supper! A sheet pan (I use the half sheet size), aluminum foil (not necessary but so helpful for easy cleanup) and optionally a quality Parmesan cheese grater is great! As long as you have a sheet pan, you’re set! 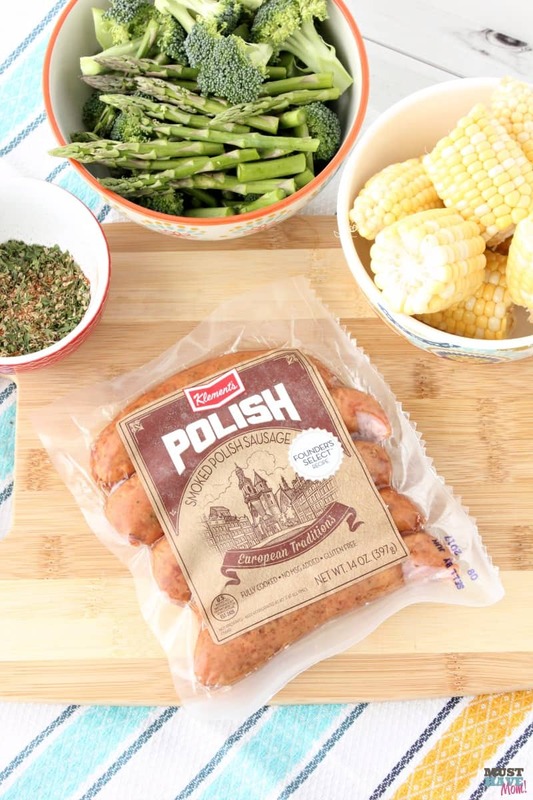 You’ll need a quality artisan sausage for your easy sheet pan dinners. We used Klement’s Polish sausage which is a blend of pork and beef, mixed with a blend of spices and it is fully cooked. The authentic taste comes from a recipe from the Old World that Klement’s has been using for over 60 years. Choose any type of sausage for your sheet pan dinner and mix it up! 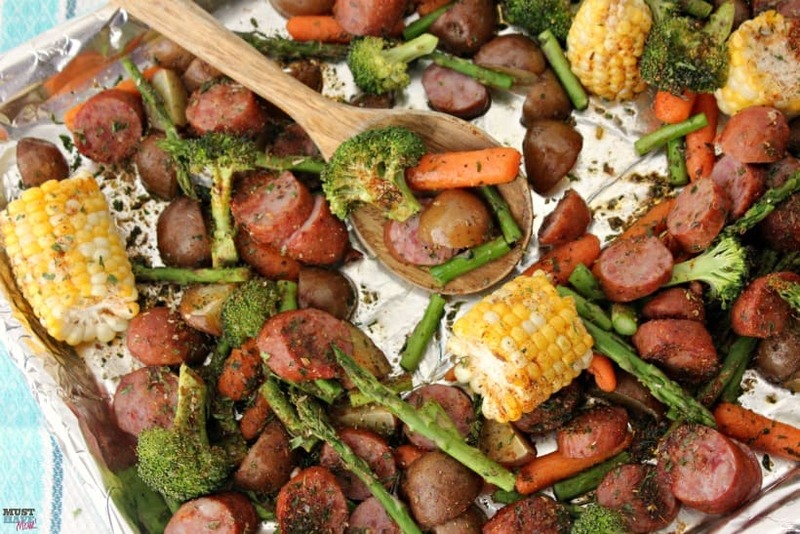 What Vegetables Can You Use In A Sheet Pan Dinner? 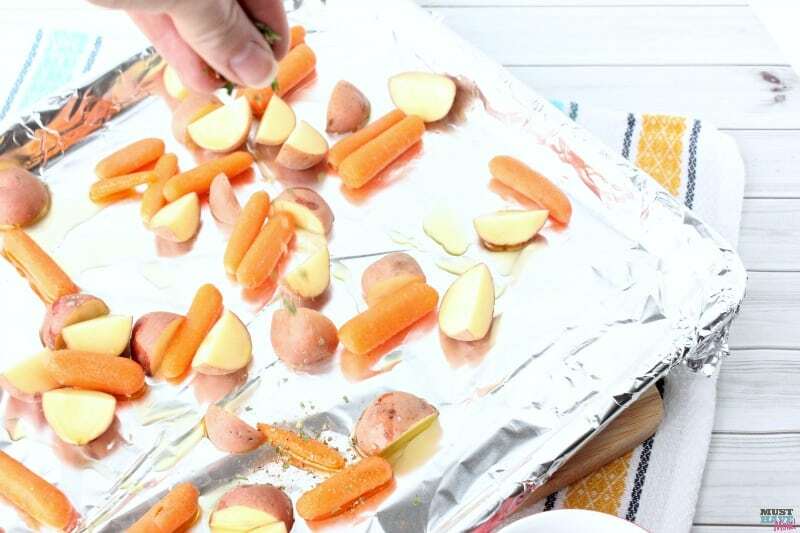 For this easy sheet pan dinner recipe, we used carrots, broccoli, asparagus and baby red potatoes. You can use whatever vegetables you have on hand. Other veggies that work great are bell peppers, zucchini and green beans. 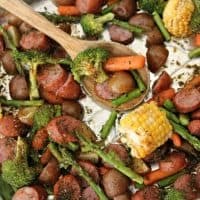 I love making sheet pan dinners when I have a variety of vegetables left in the fridge at the end of the week and need to use them up. Throw it all in there! Preheat your oven to 400 degrees F. Line your sheet pan with aluminum foil for easy cleanup. Chop your baby red potatoes into quarters. Mix together the spices in a bowl. Then, place your baby red potatoes and baby carrots on the sheet pan. Pour 2 tablespoons of olive oil over them and sprinkle with half your spice mix. Toss to coat. Bake for 20 minutes. While your potatoes and carrots are roasting in the oven, prepare the rest of your vegetables and Klement’s Polish Sausage. Cut up the broccoli, trim the asparagus and coin the sausage. Once the potatoes and carrots have finished baking for 20 minutes, remove from oven and add the rest of the veggies and Klement’s Polish to the pan. Add the remaining 2 tablespoons of olive oil and spices to the pan and toss to coat evenly. Bake for 15 minutes, or until vegetables are roasted to your liking. Remove sheet pan dinner from oven and sprinkle with freshly grated Parmesan cheese. Serve alone or over rice, quinoa or zoodles (zucchini noodles)! The thing I love about sheet pan dinners is that they are easy from start to finish. Easy prep, easy cleanup and a delicious, healthy meal is on the table in a short amount of time. That means you get to make a healthy meal for your family with very little time involved. Plus, they are totally customizable meaning you can use whatever vegetables you have in your fridge and it’s my favorite way to use up vegetables before they go bad. 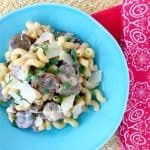 This recipe is so easy, my 8-year-old can make it! If you hate meal prep, sheet pan dinners are a great solution for prepping lunches for the week with very little time or prep involved. Give them a try and I think you’ll be sold on making them at least once a week! Quick and easy sheet pan dinners make for easy cleanup and prep! 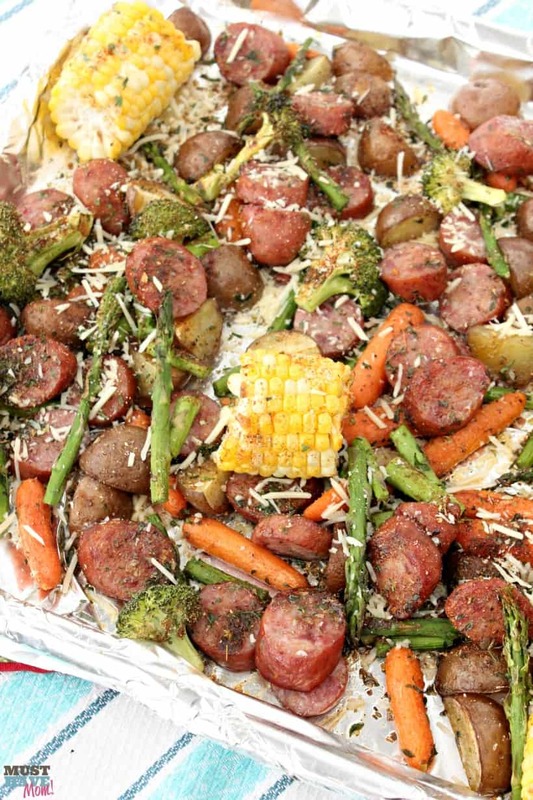 This sausage and veggie sheet pan dinner recipe is bursting with flavor and SO simple to make. Line a sheet pan with aluminum foil for easy clean up. Quarter the baby red potatoes. 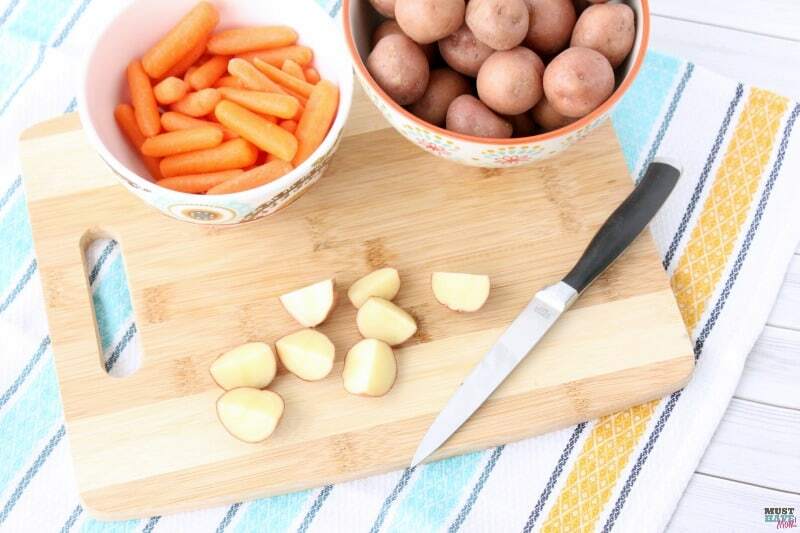 Place potatoes and baby carrots on the sheet pan. Drizzle with 2 tablespoons olive oil. Mix together paprika, garlic powder, dried oregano, dried parsley, salt and pepper. Sprinkle some of the spices over the potatoes and carrots. Toss to coat. Bake for 15-20 minutes while you prep the remaining ingredients. 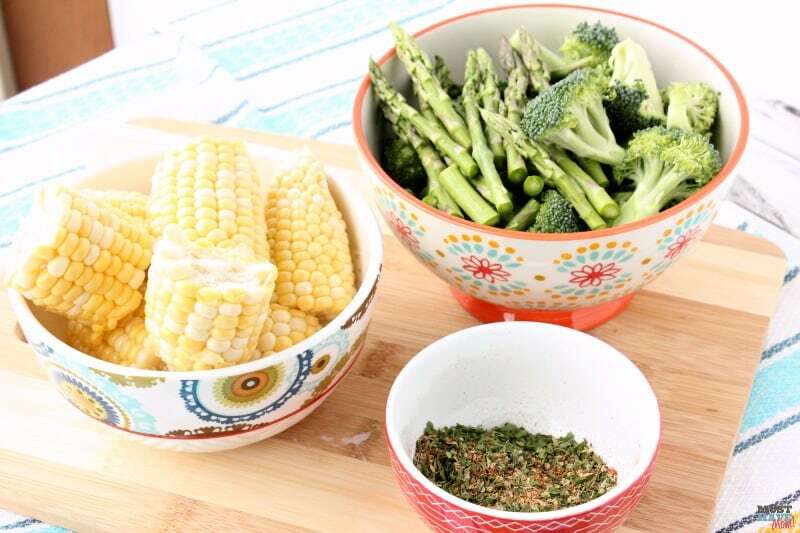 Chop the broccoli into small broccoli trees, trim the ends off the asparagus and cut into smaller pieces, coin the sausage, and cut the ears of corn into 4 pieces each. Once carrots and potatoes finish baking, remove from oven and add remaining veggies, sausage, 2 tablespoons olive oil and spice mixture. Toss to coat. Return to oven and bake for an additional 20 minutes or until veggies are roasted to your liking. Sprinkle freshly grated Parmesan over the sheet pan meal and serve immediately. You may serve alone or with rice, quinoa or zoodles! 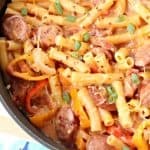 20 Minute Sausage and Pepper Cajun Alfredo Recipe! I love sheet pan dinners! I have not heard of them until about two months ago. Once I tried it I don’t think I could ever go back. It is so easy to make and it’s so flavorful. I can’t wait to try this one. Sheet pan dinners are my favorite invention in cooking! I discovered this a few months ago, and my life is soooo much better now. I am pretty new to sheet pan dinners, and have made a few with great success. This recipe looks delicious. I will definitely be giving it a try. I love sheet pan dinners like these. They’re always the best. I’m going to be giving this one a try too. It looks so good. This is so delicious looking and oh so easy. I need to try using more oven pan dinners in my meal plan. Any meal that is made on a single sheet pan is a hit with me. It makes clean up so much easier. I will have to add this recipe to the to do list. I have been looking for easy meals to make for dinner. I will have to get the ingredients I need to make this on the weekend. My kids are going to love this recipe. I will have to add it to my meal plan for next week. It looks so yummy and easy to make. This recipe looks so delicious and easy to make. I am sure it will be a big hit with my family. One pan meals are my favorite. Sausage meals are my favorite. Nothing makes my day easier than one pan dinner. I will definitely try this recipe. I am always looking for new recipes to try and I love how easy sheet pan dinners are. This dish looks delicious. This looks really good. I have never me a sheet pan dinner before. 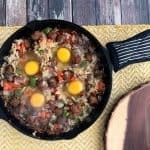 This one pan dinners are amazing and I really want make this dish because it is so easy and looks delicious. Thanks for an easy meal idea! This sheet pan dinner sounds delicious. I love dinners that are easy to prepare with none of the mess. I tried this and it was a hit for the whole family, which consists of picky eaters. Will be making this again and again. Thank you for sharing! That is amazing! Thanks for sharing this with me. What great feedback. I’m so glad your family enjoyed it. 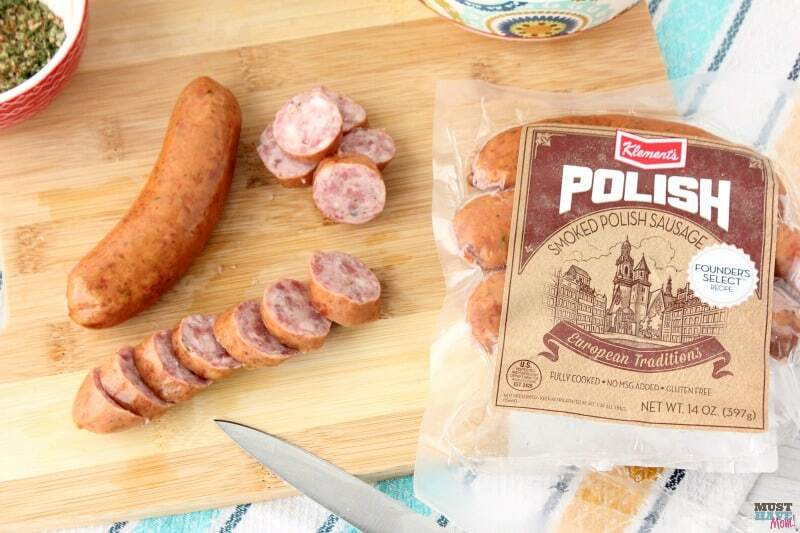 I bet the addition of polish and brats was amazing.